Ulysses S. Grant was a little known ex-army officer living in Galena, Illinois, struggling to make a go of it in civilian life when the War came along. Needless to say he found his calling in the Union Army and went on to wage a successful war of attrition against the armies of the Confederacy. Early in the War, Joseph E. Johnston and P.G.T. Beaureguard led Confederate forces at First Manassas. 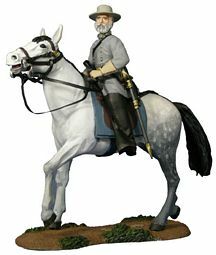 Beaureguard headed west and with A.S. Johnston would attack Grant at Shiloh, Johnston losing his life, ending hopes that he might lead the armies of the western Confederacy to victory. To round it all out a new version of Ambrose Powell Hill makes an appearance with characteristic red shirt and pipe.